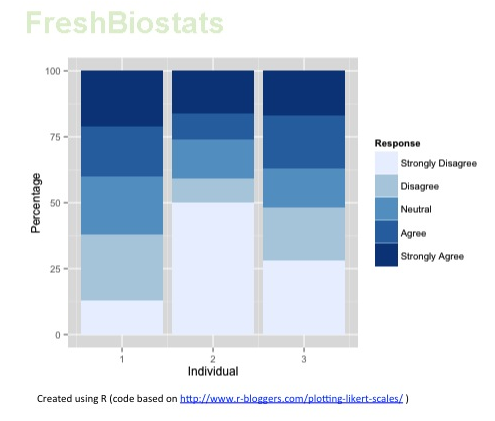 From questionnaire responses studies to plant-flowering stages and drugs effects scoring analyses, researchers and biostatisticians often face situations when some of the variables are not continuous but present fixed ordered categories instead. The straightforward approach would be to deal with this data taking into account its full nature. However, in practice, when trying to do the analysis, many professionals still take a continuous (interval scale) approach in order to ensure that the most familiar statistical techniques can be employed. 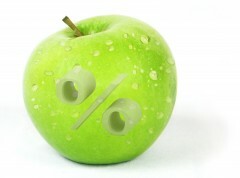 Carifio and Perla claim that this debate on the use and “abuse” of the so-called Likert scales has been going on for over 50 years, and state as one of the main advantages of what they refer to as “intervalist position”, the easy access to both traditional and more complex techniques based on the former. Other authors such as Jamieson and Kuzon Jr. et al advocate for tailored procedures to deal with this kind of variables. Their argument being based on the need to reflect the ordered nature of the data and the difficulty of measurement of distances between the different categories within variables in the case of a continuous approach. Concerns regarding plotting this data have often been raised too. 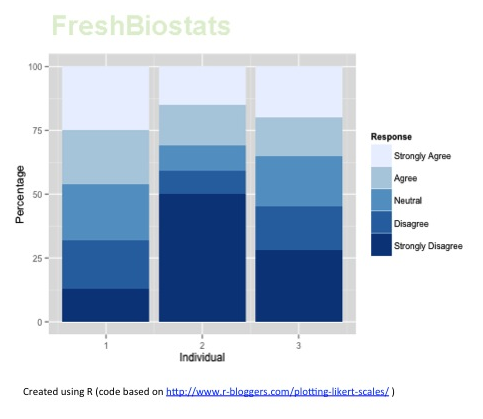 From pie to divided bar charts (see figure above and other examples here and here), it seems difficult to decide which form of visualisation is more appropriate and easily understandable. Thankfully, the arrival of new graphical applications and user-friendly specialised software like R packages ordinal and MCMCglmm, is helping bringing consensus closer and closer so we can all be soon speaking the same “ordinal language”. For or against? I look forward to reading your views on this!! Note: A highly recommended book on the topic is Agresti, A. (2010). Analysis of Ordinal Categorical Data (2nd ed), Wiley. Nice post!! I think that clmm from the ordinal package is suitable for that kind of response, too. However, the MCMCglmm can fit multinomial responses, zero-inflation,mixed models ….